Summer 2015 – busier than ever! •Buying a new apartment and moving in. •My partner setting up a new office in Brighton. •Turning 30 and having a HUGE party. •Friends visiting from New Zealand. •Performing for the weddings of 3 close friends. •More orchestral work and recitals with my brother. •The general madness of the peak of wedding season! It’s been one of my busiest summers yet, with 14 performances in August alone. I literally played for four weddings and a funeral in one week! That’s never happened before! It’s been tiring but also nice to be so busy. I’ve really enjoyed played for my clients and their guests – surprising them with their favourite pieces, and hearing them sing along. Performing for my friends is always the most nerve-wracking and emotional though. It’s been quite a sentimental summer – my oldest, dearest friend got married and I played a piece for her that I used to play on the piano while she danced when we were children. 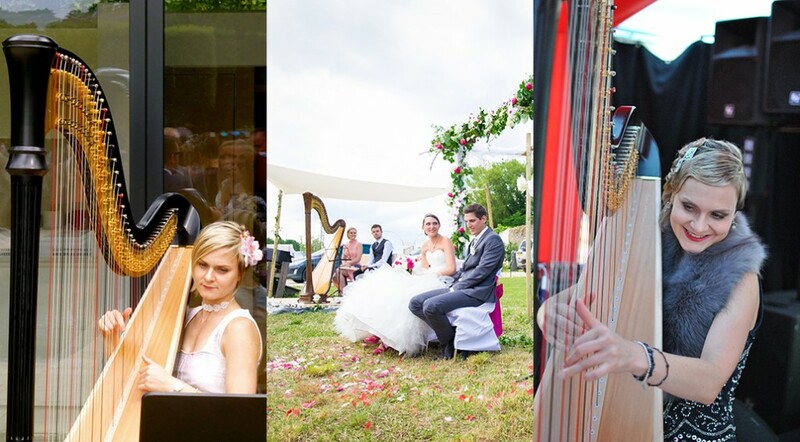 My last ever performance on my Salvi Symphony harp over in France for the wedding of two of my wonderful friends over there. Playing for the brother of one of my school friends and catching up with his family, some of whom I haven’t seen for about 10 years! But for me, of course the best was my 30th birthday party. It was 1920’s – 1930’s themed, and what with my and my partner’s experience in the entertainment industry, we went all out with live performances, DJ sets, two fully decorated speakeasy marquees, cocktails and champagne. My Mum’s best friend, who is a saxophonist, surprised me with a wonderful performance of the Poirot theme tune, she also performed with her multi-talented daughter. My friend from university came all the way down from Yorkshire to play the piano (so beautifully), his first performance in years. My brother got everyone going with some great songs, and I also performed solo, with my partner, and with my brother. But the best thing of all, the highlight of my whole summer… my partner surprised me with the most beautiful performance ever of the piano transcription of Debussy’s Prélude à l’après-midi d’un faune, my favourite piece of all time. He’d been learning it for 6 months without me even knowing! I didn’t actually realise what an excellent pianist he is until that moment. He’d even researched it properly, reading articles and watching lectures and world-class performances of the arrangement, to make sure he got it just right. It was perfect, I’ve never been happier in my whole life.